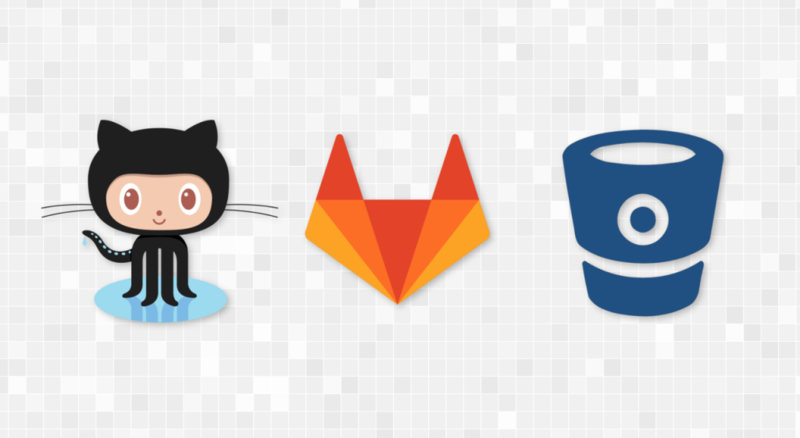 Part 6 of this series of posts around my quest for tools that would encourage or facilitate collaboration with and between designers, this time, I went over what I’m calling the Githosters, also known as Github, Gitlab or Bitbucket. Github is so popular these days it might become a verb one day and for some, there is still confusion between Git and Github. But since its beginning in 2008, coders have embraced it. It’s their social network. And they’ve been followed by a growing population that works also sometimes with coders such as journalists, jurists, typographers, icon designers, cartographers, etc. So we’ve actually come a long way since SourceForge − once the “only” place to get some open source software − and I guess, for the better. Github also helped popularize Git and became a central place to experience “code based” development as a community. With a major web actor such as this one, comes a list of alternatives, such as Bitbucket, pretty much born at the same time (at the beginning using only Mercurial, but later also Git) and more lately, Gitlab, the open source equivalent that you can host on your own servers. The crowd that has followed the coders is the one that’s the most interesting to me. And I’m guessing the future of these tools depend on it. The winner in the next years will be the one that manages to keep its crowd of developers while providing relevant tools for all the other creators that surround it. And we can see that some of those players have started to understand this. Let’s start with Github, since they are leading the pack. 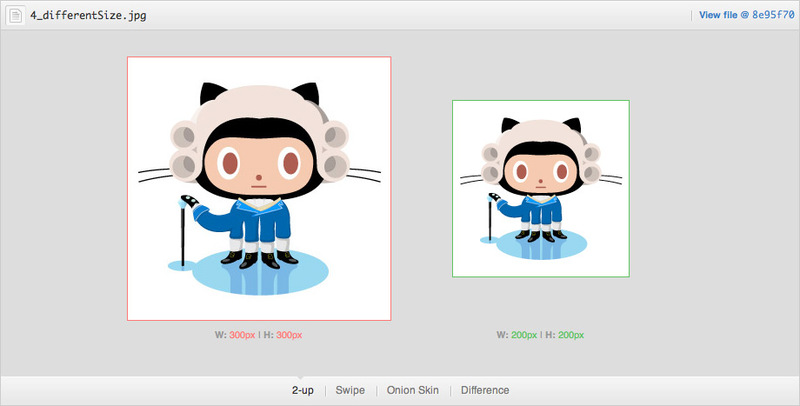 Github offers previews and version comparison for certain files. Which means that you can see how some of your graphic files have evolved through their commit history. They do this for psd, jpg, png, gif, svg and stl files. They also support rendering of pdf (but no diffing). It’s worth noting that Github renders also IPython/Jupyter notebooks, csv tables and geojson map files (the latter with diffing), appealing there to the data scientists and alike. All of these features are great and can encourage non-coders to use that service. But it’s very limited to viewing a file, just one, and in some cases, compare 2 versions of that file. But the rest of the interface is pretty focused on code only. Coders might know what to do with a file just by seeing its name, but designers like previews and thumbnails. And none of this is available so far, resulting in many clicks to view the content of a folder and finally seeing the file you were looking for. I do understand that this is a tool for coder, but if Github wants to please another crowd, they might have to propose a different interface. I’m guessing they could do this through an desktop client − by improving the one they already propose for example − or by providing a different web interface depending on your role. The issues and comments could also be enhanced to enable some form of “image annotation”. 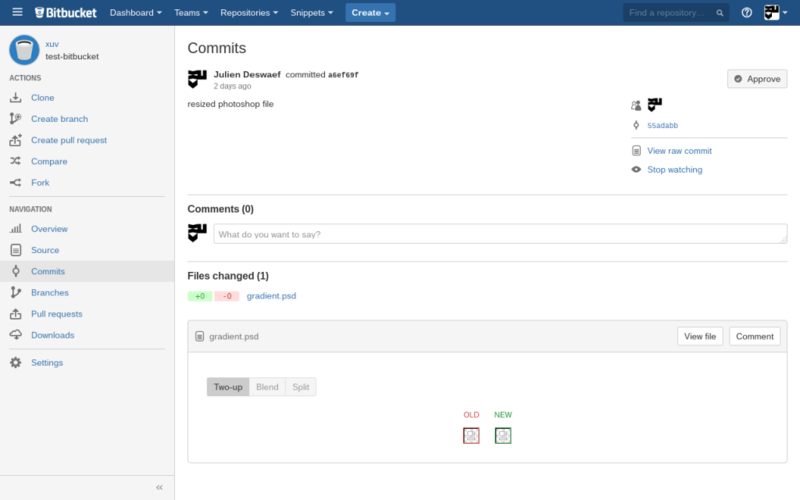 Bitbucket, from the point of view of a developer, does not seem to be lacking features compared to Github. It boils down maybe to some interface choices, but they overall look the same to me (although I’ve not used Bitbucket extensively, just for this test). Although with graphic file handling, I had the feeling Bitbucket is still buggy or unpolished in the corners. They seem to go in the same direction as Github, but if psd files are supposed to be rendered, all I got was broken/empty previews. The rendering and diffing works for svg, jpg, png and gif. Good. But no pdf rendering and most “binary” file formats spill their content source when viewing commits. I know it’s the default behavior of Git, but this creates pages and pages or gibberish content in the web browser that is totally unnecessary. Like Github, Bitbucket proposes an in-browser file editor, if you quickly wish to correct a typo somewhere and commit immediately. But why offering this feature on image files? At first, I though: “wow, could I edit my image files right in the browser with Bitbucket?“. Answer is no, you’ll see a series of characters (Base64? or cyphered exif data?) that you’d better not touch if you don’t want to make your files definitely unreadable. Bitbucket also offers a desktop client, but didn’t take the time to install it as it was looking more like a Soyuz cockpit again and only seemed to focus on coders also. Lastly, let’s go over Gitlab CE, perceived as the open source clone of Github, but I guess that’s what most of us expect. Their Community Edition (CE) is a full featured “Github clone” that you can install on your own server. So it’s pretty convenient if you care about secrets or the indieweb. Unfortunately, they support fewer features regarding image handling. You’ll get a preview of most web file formats (jpg, png, gif, but not for svg) and visual diffing for those. But no pdf viewer (yet) or other fancy stuff. Since Gitlab is open source, it means we could drive it in the direction we’d like, or at least we might make propositions or fork it to bring it into a more designer friendly direction. Although the fork is maybe too far fetch as they seem to be very open to new propositions. Even if these 3 solutions are a little poor relative to what we’ve seen in previous posts about collaborative tools for designers, I’m definitely in favor of a Git based solution than a Dropbox (or similar) solution. What Dropbox misses totally is the collaborative work between designers and developers. And devs will never use Dropbox to version or share their code. 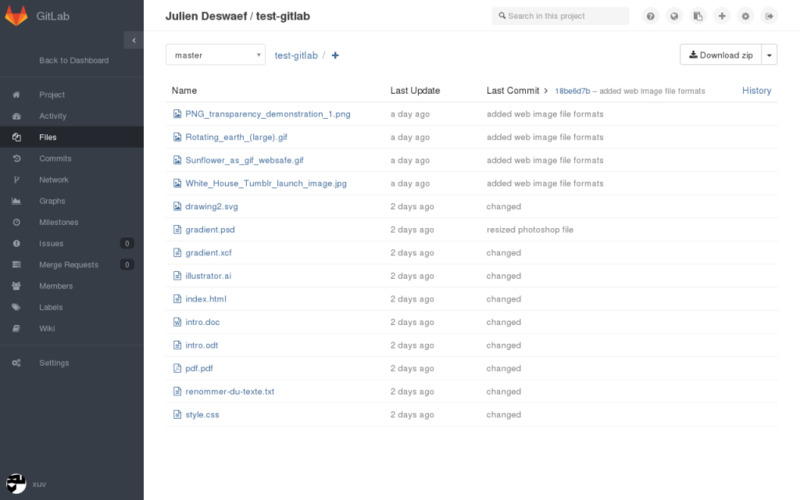 While designers, provided with the right interface, could totally switch for Git. In that sense, for those looking for an easy solution to collaborate with developers on Git repos without learning any Git command, I recommend SparkleShare. It’s kind of like Dropbox, but with a Githoster backend. Though you better warn your devs that you’re going to use this, because your Git commits are going to be pretty dull and voiceless. For the rest, it’ll be as simple as saving your files from your preferred graphical application into the right folder. All the rest such as pulling, committing and pushing is handled by the Sparkleshare, running in the background. That’s it for this part. I know there are some other Githosters out there. I did not want to go over them all, just the most popular ones. But if I missed one that has some great features or that is much more promising for designers, don’t hesitate to drop a line in the comments or contact me.